There are several settings that affect how your Time Clock functions. Some of these settings are at the organization level and affect all staff (global) while others are set at the individual staff level. These settings are global and apply to all staff. Edit these settings from the Staff Portal menu > Settings > Portal Settings. To use the Attendance feature of the Staff Portal check Time Clock in the Features section. Save Changes. The Staff Portal is always available at your facility when you, or another User, has launched it from within Jackrabbit (see Launch the Staff Portal from within Your Database). The Staff Portal can also be launched via a URL. The Staff Portal URL link can be placed on your website, or saved to a smart device, allowing staff to log in from anywhere with internet access. See Launch the Staff Portal Remotely for full details. To allow staff to enter their time in the Portal when it has been launched remotely, set Allow Remote Attendance to Yes (the default is No). There are several staff settings related to the use of the Staff Portal Time Clock. This information is located in the various tabs of the Staff record. To use the Time Clock, each staff member must have a valid email address. Jackrabbit will use this address to send the staff person's initial Staff Portal password set up link. 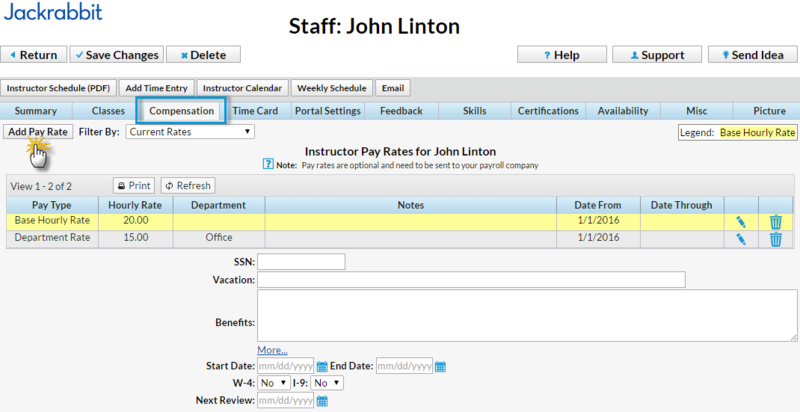 If you currently use staff/employee ID's, these can be entered in Jackrabbit and they will display on the Pay Rate Report and in the Export to Payroll spreadsheet reports. If a staff member is salaried (not hourly) and you will be using Express Payroll, ensure that you have the Salaried field on the staff member's Summary tab set to Yes. This is only necessary if you will be using Express Payroll for payroll processing. Since salaried employees must be set up separately with Express Payroll, setting this to Yes omits this staff person's data when the Export Express Payroll File button is clicked. 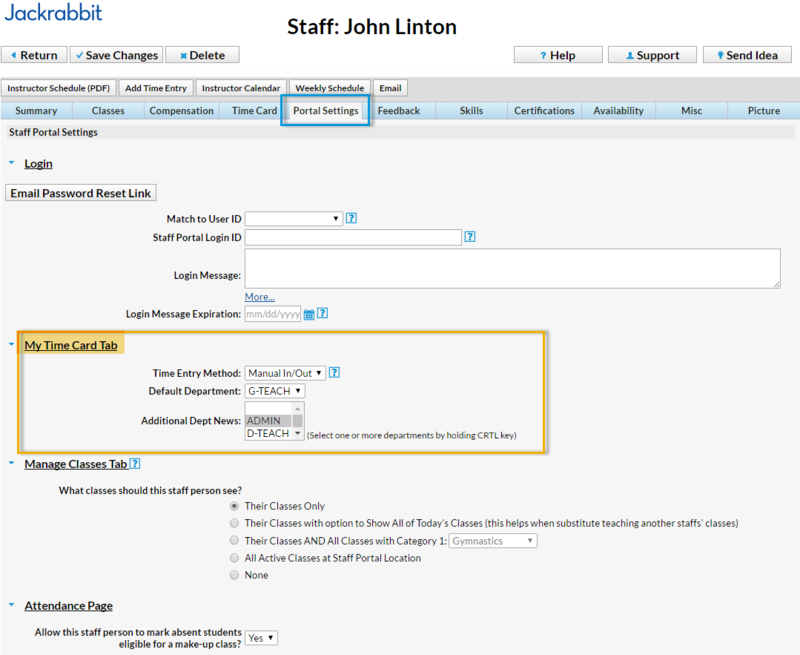 Omit the staff member's name from all Instructor drop-down lists (filters) throughout Jackrabbit. Omit the staff member from the Daily View calendar. Omit the actual vs scheduled hours comparison on the Approve/Unapprove Time page. Allow you to email instructors and non-instructors separately. There are four sections of settings on this tab including: Login, My Time Card Tab, Manage Classes Tab, and Attendance Page. In this topic we will cover the My Time Card Tab settings which are related to the Time Clock. There are three ways a staff member can record time in the Time Clock: Clock In/Out, Manual In/Out, and Total Hours. Only one method can be assigned to each staff person. See our article Time Clock Time Entry Settings for a description of these methods. A default Time Entry Method can be set in the time clock Time Entry Settings from the Staff Portal menu > Settings > Portal Settings. You are able to overwrite that default on any individual staff person's record. See our article Time Clock Time Entry Settings for a description of these methods. Our article Time Clock Departments discusses departments and how they are used. Each staff member can be assigned a Default Department. This is the department where they work the most frequently. When inside the Staff Portal Time Clock, all time entries will be automatically set to the Default Department. The staff member will only have to change this when they are working in another department. All departments are available to be chosen/selected by the staff member. Note: There is not a way to limit a staff member to specific departments only. If you would like this staff member to see any other departments' news when they log into their Staff Portal, select those departments in Additional Dept News. (Department News is added from Staff Portal Settings > Settings > Department News). We understand that compensation is very sensitive data and offer the ability to hide the Compensation tab using User ID permissions. Staff pay rates are optional but are useful if you want to keep a record of this information in Jackrabbit. If a Pay Rate is entered, Jackrabbit can calculate Estimated Gross Wages (on Staff Hours Report). There are 2 different Pay Types: Base Hourly Rate and Department Rate. These are reserved and can't be edited or deleted. Note: These are the only Pay Types which work with the Time Clock. Base Hourly Rate: The default hourly rate (assign for each employee under their Compensation tab, Add Pay Rate, Base Hourly Rate). If a staff person has multiple pay rates, their Base Hourly Rate would be the rate the staff person is paid the most frequently. If a staff person has 1 rate of pay and works in multiple departments, it's not necessary to create department rates for them. Staff can enter the department in their time entry and the system will always use their base hourly rate of pay for the estimated gross pay calculation. Department Rate: the rate for a specific department. For example, John works in the Teaching department at $20/hour and the Office department at $15/hour. John would have 2 department rates (Teaching $20 and Office $15). If John worked most frequently teaching, then his base hourly rate would also be set to $20. The system calculates Estimated Gross Pay. It's called "estimated" because the Time Clock does not calculate overtime dollars, only regular hour dollars. The system also does not calculate any withholdings, deductions or payroll taxes. The estimated gross pay calculation is based on what information the staff person enters into the Time Clock. If department rates were created, the system matches up the department of the time entry with the department pay rate, in order to know which rate of pay to use in the calculation. Therefore, a staff person can have a different pay rates for each department the person works in. Example: John works in the Teaching department 5 hours and Office Department at 2 hours. Estimated Gross Pay = $130 [Teaching $100 (5*$20) and Office $30 (2*$15)]. The staff person's base hourly rate will be used to calculate estimated gross payroll if department rates aren't created. Also, if a staff person forgets to select a department while entering a time entry, their estimated gross pay will be calculated using their base hourly rate. Click the Compensation tab for the staff person. In the Add Pay Rate window, choose Base Hourly Rate (most frequent department / rate) or Department Rate. Enter Date From / Through dates. Additional detail can be added in the Notes area if needed. While it is possible to have more than one base pay rate, only one should be current at any given time. Date From / Date Through determine which base rate is current. If more than one base pay rate is entered for a staff member, be sure that only one of them has current Date From / Date Through Dates. Example: Staff member currently is paid $15 per hour but will receive a $2 per hour pay increase effective June 1, 2016. The current base pay rate would would show a Hourly Rate of $15 with dates 1/1/2016 - 5/31/2016. The new base pay rate of $17 can be entered as well but should have a start date of 6/1/2016. The Compensation tab also has fields for other optional information (SSN, etc.) If any additional information is added, be sure to click Save Changes.